The Hero Leap Hybrid Scooter may be destined for a commercial launch by early 2015 according to a report. Hero is not expecting the scooter to sell in large numbers, only 6,000 units will be rolled-out in the first year of production with changes being made in time with the spike or dip in demand. The scooter is expected to be launched in other markets first before it makes its way to India, the markets where EVs and hybrids are in demand will be mainly targeted. If the Indian government makes any headway with the NEMMP (National Electric Mobility Mission Plan) 2020, Hero could look at being more aggressive in the segment here. What do you think of this development? Should Hero launch the Leap in India earlier? Is there a market for hybrid vehicles in India? Let us know in the comments section below. Hero MotoCorp had first showcased the Hero Leap hybrid scooter concept at the 2012 Auto Expo and now the Hero Leap hybrid scooter has been revealed in it’s production guise. The Hero Leap is the country’s first hybrid scooter and runs on a lithium-ion battery which teams up with a 10.7 BHP electric traction motor. The fuel-combustion powertrain is a 124cc unit which is an all new unit developed by hero and uses a belt to drive the rear wheel. The Permanent Magnet Alternating Current (PMAC) motor delivers a torque of whopping 60 NM right from the word go. We believe it will be in the range of Rs 90,000-1,00,000 at least. The Hero Leap hybrid scooter can hit a top speed of 100 kmph with the petrol range extender motor and the scooter is a pretty silent one too. The scooter gets a LED projector headlamp, a position lamp and a stop lamp. You get a small wind shield too which seems like an after-thought but manages to gel well with the overall package. The scooter’s length stands at 1884mm, width is 850mm while the height stands at 1162mm. Its wheelbase stands at 1347 mm which is pretty good too. So it has the dimensions of a regular scooter and will come across as a good alternative for city commuting. You get a 240mm disc brake up front and the rear wheel gets a 130mm drum brake. The hybrid scooter gets a 110/70/13 front tyre while the rear tyre is a 120/70/11 unit with both of them getting mounted on alloy wheels. 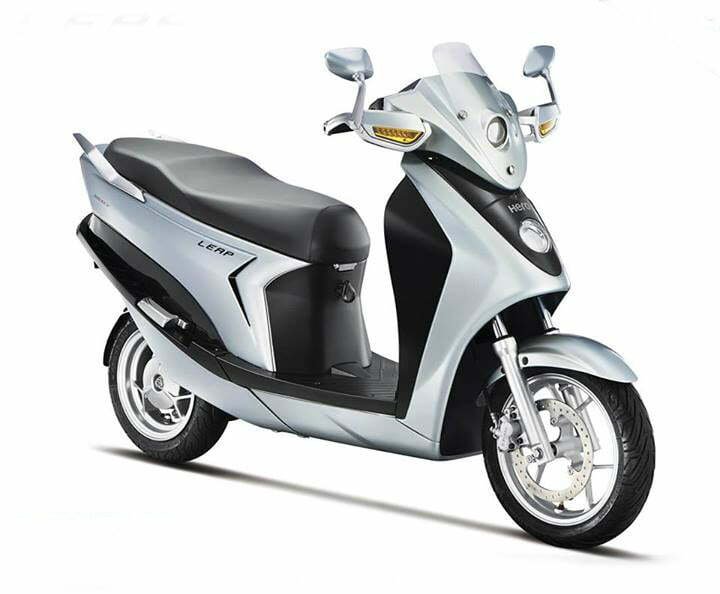 The scooter weighs a hefty 140 kgs with a steel tubular frame as its underpinnings. The fuel tank capacity of the scooter is 3 litres. Hero Motocorp has placed the battery and the motor in a manner that you get a low centre of gravity, thus making it pretty agile for city maneuvering. The hybrid scooter comes shod with regenerative braking for better stability when braking hard. It will come with Fuel-injection so cold morning starts are taken care off as well. Hero claims that the leap will have a range of about 340-350 kilometres upon combining petrol and electric modes and we believe that is pretty good too. Hero has now started to show its prowess in the two wheeler department and what all it has in store. Would you buy a hybrid scooter? let us know your thoughts in the comments section below.